This year was my first time attending Mbokodo awards ‘Celebrating Women in the Arts’. Ang’zange nga kuzwa ukubumbana kwabantu besifazane kanje. Our mission for the night was to make sure we support Lindeka Qampi as a nominee in the ‘Creative Photography award’ category. Terra, Lindeka and I looked snazzy, as we headed over to Joburg City Hall, were the event was hosted. We took over the space through the lens and trended social media as if the event was our baby. Mbokodo awards were hosted by female comedian Tumi Morake, who introduced speeches by honorary members from the Department of Arts and Culture. Its 21 Years of Freedom and we have finally mastered a space for the recognition of women and the positive influence and change that they contribute to our still transforming democracy. If you are you are told the story by the hunter, you will never know the heroism of the hunted. Our table was riddled with winners, nominees and highly esteemed women in the arts & media industries. We enjoyed the vibrancy shared with Mamela Nyamza – nominated for the ‘Dance’ award, Oyama Mbopa, Shado Twala – Mbokodo Awards adjudicator, Monique Pelser – nominated for ‘Creative Photography award’, Thandiwe Tshabalala – winner of the ‘Creative design award’, Brenda Sisane – winner of the ‘Promotion of Arts in the Media’ award and Goitsemang Lehobye – winner of the ‘Opera’ award. These individuals were on fire in support and celebration of the winners that have been part of our collective spaces as artists and media frontiers in South Africa. We also celebrated the winnings of Mbali Vilakazi – winner of the ‘poetry’ award. She said, ‘2015, year of the underdog’. Zolani Mahola of the South African band ‘Freshlyground’, also won the ‘music’ award. 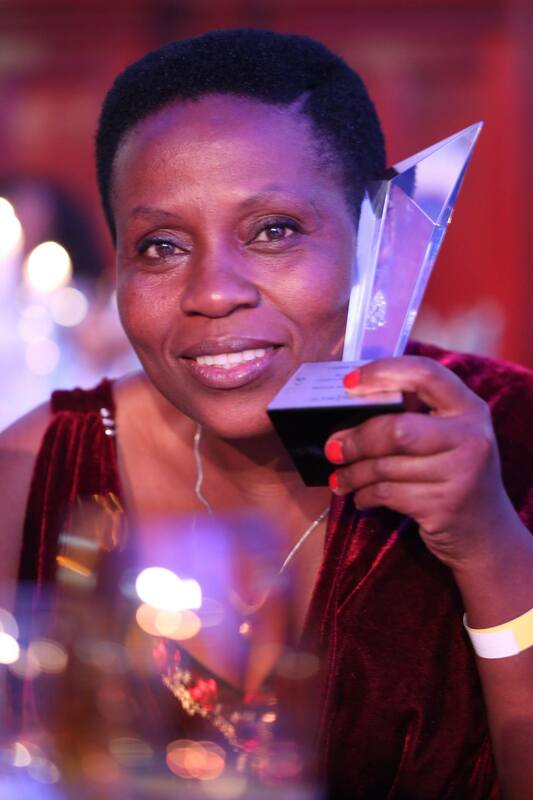 We were graced with speeches from artists such Dada Masilo – winner of the ‘Dance’ award who expressed her joy from gaining recognition in her home country. As well as Lindeka Qampi who panted through her speech struggling to believe that her win was real. She gave a sentimental and light hearted speech, she left the stage bouncing from one foot to the other like the tomboy that she usually is. After having accepted her award with her shoes off as they were causing discomfort while she obviously had to take photographs as she had stated. ‘I would like to thank Mbokodo awards for this award, it is very special to me. I never fully believed that I was nominated for this award until tonight. I would like say thank you to God. I would like to say to Zanele Muholi – you are the oxygen in my life. To my four kids – ndiyifumene into ebendiyizela lapha (I got what I came here for). The best performances took place with Vicky Sampson, KB and Swazi Dlamini performing Vicky’s 1995 Rugby World Cup smash hit ‘My African Dream’. To our surprise we were also graced by the presence of Dorothy Masuku, who at 80 years old performed as if she was still young, but definitely never dropped the fresh! We sang a jolly happy birthday to her and were then wowed by the serendipitous opera sounds of Sibongile Mngoma a past Mbokodo award winner. The evening ended with South African Jazz Legend Thandi Klaasen singing the heartfelt jam ‘Meadowlands’ in a frail and memory fading state, she still rocked the stage. There I was a young poet and activist trying to penetrate the arts and media industry mingling with the cream of the crop. Women I look up to, women I have worked alongside with, women that I never thought I would meet in my lifetime; and even women that I have been downtrodden with. There is something about knowing the struggle behind someone’s success, which makes it feel as though their every single achievement is something that you are personally achieving too. I left the awards with a mission to be one of the women that receive an award in the next two years, a pot plant of orchids – which symbolized my mother’s presence in the audience, and of course Shado Twala’s contacts who personally asked me to send her my work because she believes that there is just something about me! I am truly humbled. Mission accomplished – Lindeka took home the ‘Creative Photography’ award – the greatest accomplishment of our household in 2015. Thank you to Carol Bouwer and her crew for creating such a powerfully inspirational space for women, by women. You give us something to aspire for in the realization that the bigger picture is still searching for many pieces to the puzzle of our liberation. This entry was posted in Another Approach Is Possible, Archived memories, Creating awareness, Power of the Voice, South Africa, We Are You, We Care, We Still Can with/out Resources, Writing is a Right and tagged 2015 Mbokodo awards, 21 Years of Democracy in South Africa, Acceptance speech, Accomplishment, Address, Ally, Art, Arts & Crafts, Audience, ‘Creative Photography award’, Black women, by Christie van Zyl, Categories, Celebrating Women in the Arts’, Celebration, Collectivism, Dance, Department of Arts and Culture, Education, Educator and mother, Entertainment, Expression, Fashion, Feelings, Freedom, friends, Friendships, Gaining popularity, Heroism, Human beings, Humbled person, Inkanyiso media, LGBTI community, Life, Lindeka Qampi, Lives, Living..., Mainstream media, media, Memory, Mother, Musicians, Network, Nominees, Photography, Positive, Presence, Recognition, Relationships, Respected, Sexuality, Solidarity, Speeches, Statement, struggle, Style, Support, Talent, Thank yous, the winner, Transformation, Visual activism, Visual history, Voices, We love photography, Winners, Words, Writing is a Right, Zanele Muholi. Bookmark the permalink.